If you are reading this blog, you are to be commended for your good taste, enjoyment of beauty, and the peace of mind that it brings to your Spirit. 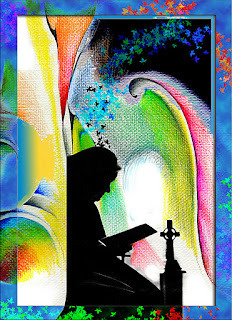 The silhouette in this picture is of my sister, who is at prayer. Some butterflies (or were they leaves?) appear to be flying from the top of her head. I love this picture. I think that prayer can open us up to the magic of our own creativity . This can happen if we have a solid relationship with a higher power. My hope is that everyone reading this has a joyous and prosperous 2012. 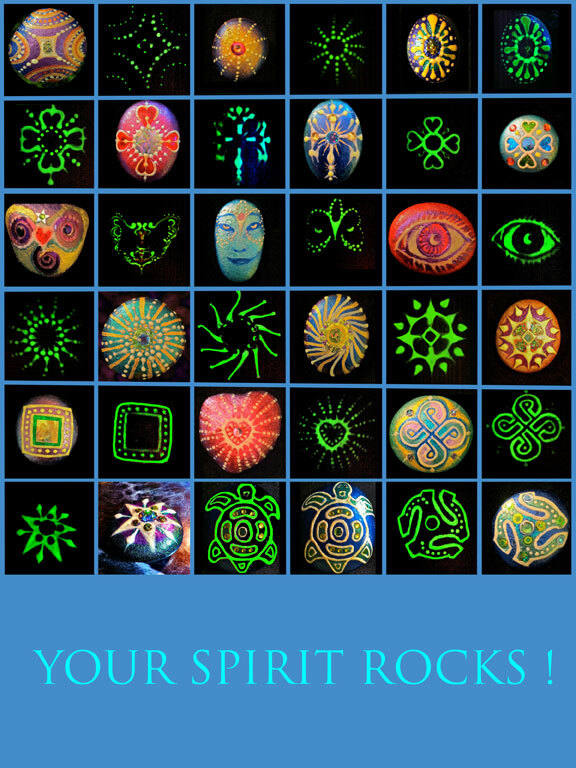 Leave a comment on how you use your Spirit Rocks. Some people use them as paper weights or table ornaments.Others use them as meditation devices. How do you use them? It’s Wednesday the 28th of December, 2011. I sense that big changes are in store for 2012. 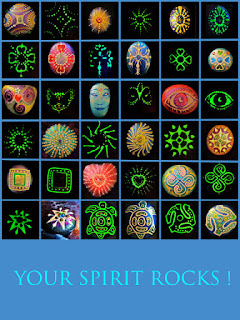 As I write this, I am still debating whether or not to launch the web site “Your Spirit Rocks.com”. Already I have purchased the domain name, but what does that mean? All is says is that I have a place holder for that name. 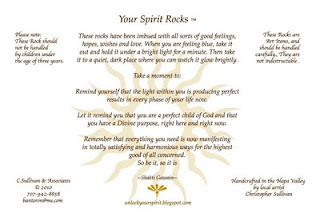 The name,“Your Spirit Rocks!” is a double-entendre (and the exclamation point was added for emphasis) that immediately sounds like a wonderful compliment, but in another way, can be referring to item(s) or a quality that you possess. My hope is that the website will incorporate both interpretations intentionally. One’s spirit as I understand it, is an essential element of one’s personality. Just as I have discussed very early on, that these Spirit Rocks are meant to be passed along. It does not matter if they are kept for a day or a lifetime; So long as they are given in the spirit of GIVING. 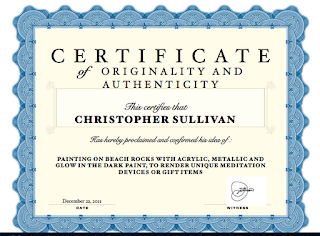 If you get one, and if it does not really reflect your own Spirit, I would encourage you to pass it along to someone else, so that (in principle), The rock will find it’s way to the one for whom it belongs. Ultimately, it is assumed that we know it is the earth for whom this rock belongs, and will find it’s way back. Above is a picture of the home where most all of the rocks were gathered. I have taken this document to be notarized and sent via registered mail to myself, to verify that I am it’s author. Now I hope that it generates a lot of interest and enthusiasm for everyone who supports it. This one I call " Bluenew" because I have run out of names to call these blue rocks. I think I will have to start numbering these rocks to be able to catalog them. 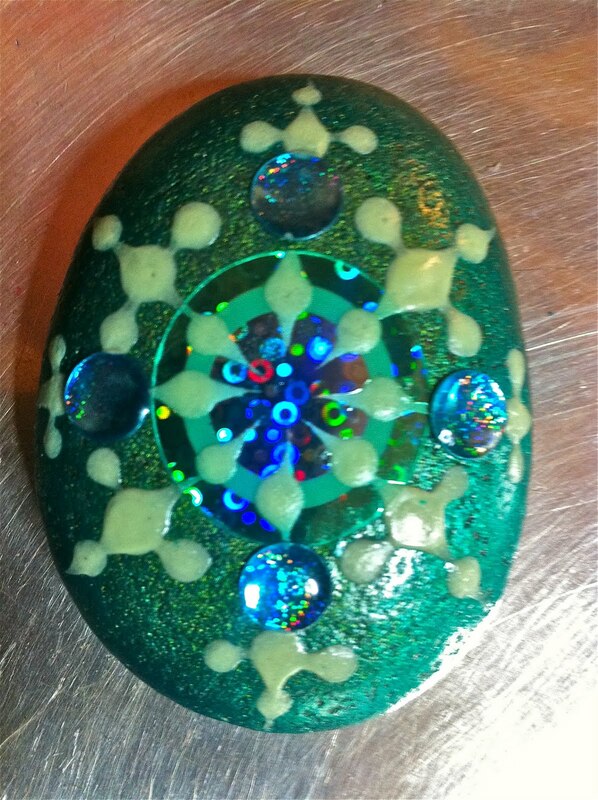 I am certain that I have painted over five hundred rocks this past year and will have to create a ledger in order to keep track of the designs. I have started adding little gold flourishes to these designs using a sharpened chopstick. I go through my #00 brushes weekly and the cost begins to add up. Today I purchased 9 - 18"X24" Frames for my show in February. I have just begun my third poster design. I hope to have all 9 posters done in time. I officially got my resale permit today and will begin doing a quarterly tax. The fun never ceases. This rock was one of those “Heart-Shaped” rocks that I am always looking for when I'm out at the ocean replenishing my collection.Amazingly, this is an almost perfectly symmetrical shape! I liked the decorations on it , and that it was dainty enough to fit inside one of my refrigerator magnet boxes, although I did not glue a magnet to the backside.I ended up including it with another small rock to make a box set for a couple of young lovers. Well, when a customer spotted it on Sunday, she insisted on breaking up the box set to purchase this rock separately, and I let her. Sometimes you have to make concessions. The tin box was left with only one lonely heart rock inside. I could feel the pain. Now stop crying, it’s only a rock. This rock was easy to do. I’ve gotten pretty adept at the basic starburst designs and can crank them out in about twenty minutes to a half hour after the rocks gradient has been applied. The background is a combination of Photoshop filters which give it a rather mystical quality. The colors are deep and rich which helps make the center really pop. This is the look I’ve been wanting to achieve. This rock will serve as a basic prototype, for which others can then be matched. This rock represents where I am going with this particular medium. It seems that objective types of symbols are fine for gift items, but I really want to create unique talismans which people will use as meditation and dream devices.No two rocks are really alike, although I have used similar imagery on those rocks which seem to resonate with me. Art, if you are going to call it that, has to have something which inspires or motivates the viewer to move forward. Let me start with Wednesday... I drove my white Potato car into St. Helena in hopes that I would still be able to squeeze a few more miles out of what any mechanic would describe as a failing transmission.Smoke started to emerge from under the hood as the car barely made it into the town of St. Helena. I parked by a Middle School and immediately called The Polly Klass foundation to donate the vehicle. 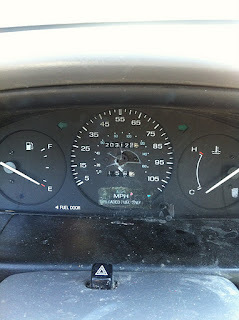 After arranging a pickup, I locked the car up, and walked from there to the credit union about a quarter of a mile away. Arriving there, I walked up to the teller and requested a loan application. I filled it out and after submitting it to the bank officer, I proceeded out the door and down the block to the Zumalt dealership to purchase a 2010 Ford Focus. 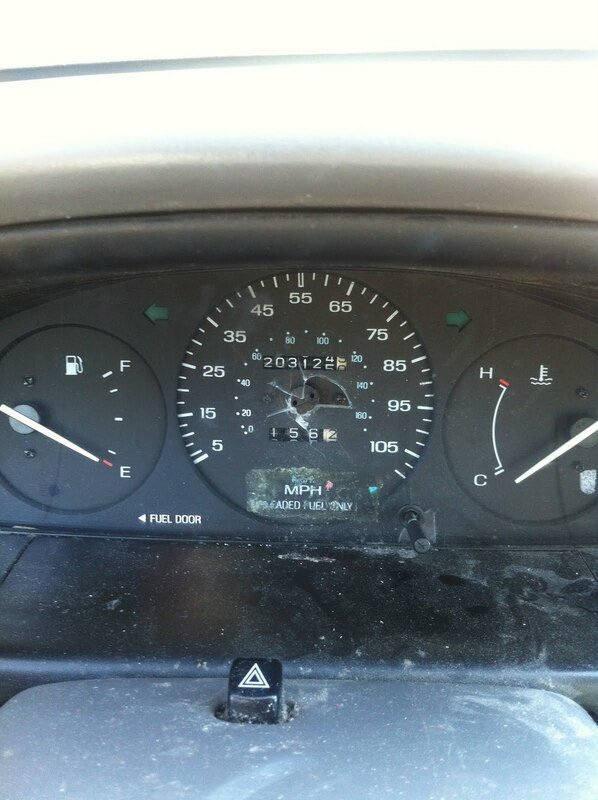 Incredibly, I was able to drive the car off the lot that night and now had transportation to get to a Personal Mastery workshop in Novato the next evening. Bob and Linda Kranzke have been friends ever since I met them years ago in San Francisco, while attending personal growth workshops at Creative Communication Experiences (CCE). Bob graciously invited me to attend this Personal Mastery Intensive, and let me spend the nights at his home for the duration of the workshop. The workshop itself was fantastic, as many areas of “How I live my life" were addressed. The synchronicity of events leading up to this past weekend were uncanny. 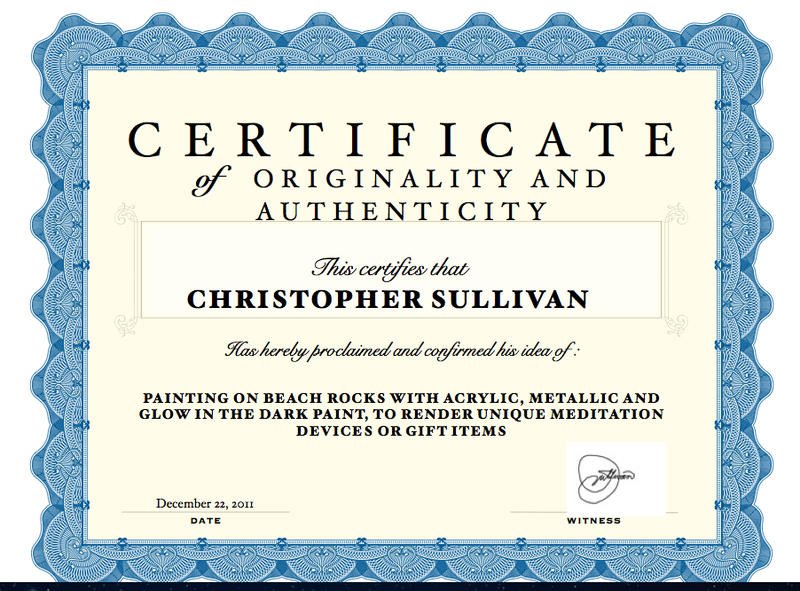 I made many new friends and was able to identify myself as a "Rock Artist” for the first time. Interesting how things come together. This is a decorated stack of rocks called a “Cairn”. These were popular throughout countries like Scotland and Ireland to show people that they were on the right path, long before street signs. As the Farmer’s Market season draws to a close, I would like to thank all of you who came by to visit me at the Spirit Rocks table. This was my first year doing this, and I hope to build this little business. You have made it all worthwhile for me, and I hope to continue along these lines. 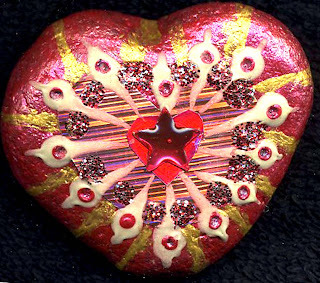 So if you are reading this, please stay in touch and contact me for any special gift rocks you would like me to create. Your Spirit Rocks ! The Image below can be seen in a larger window by clicking on it. This summer has kicked into high gear at the Farmer’s Market. 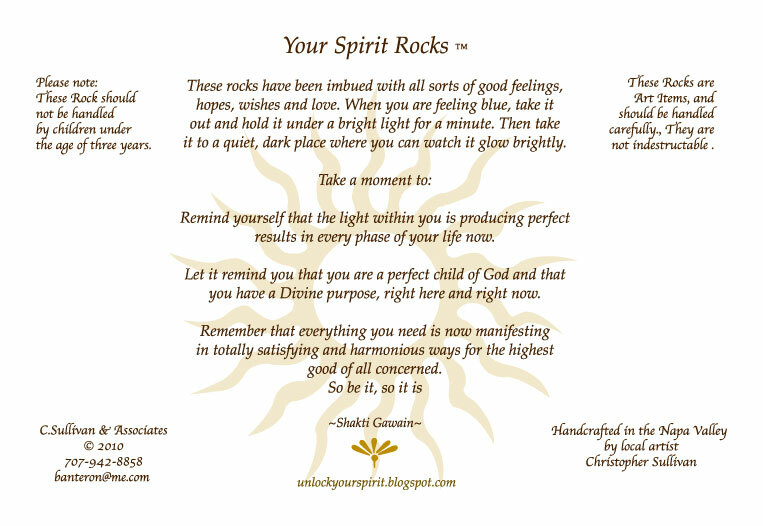 Many of you have found your way to the YOUR SPIRIT ROCKS! 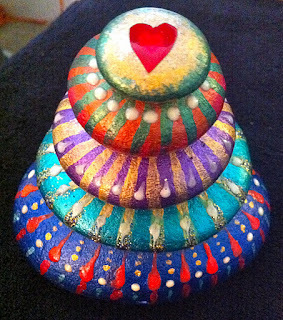 ™ stand to purchase a rock or pendant for a friend or loved one. Lately, the designs have become more sophisticated. Stacked rocks, Animal talismans, Ancient Symbols and a whole new assortment of different sizes. No two rocks are alike, which makes it fun to watch as you take your time to pick a rock that is to your liking. It is amazing to watch a smile break out across someone’s face as the right choice is made. So I thank all of you for visiting the Calistoga Farmer’s Market on these beautiful Napa Valley mornings. 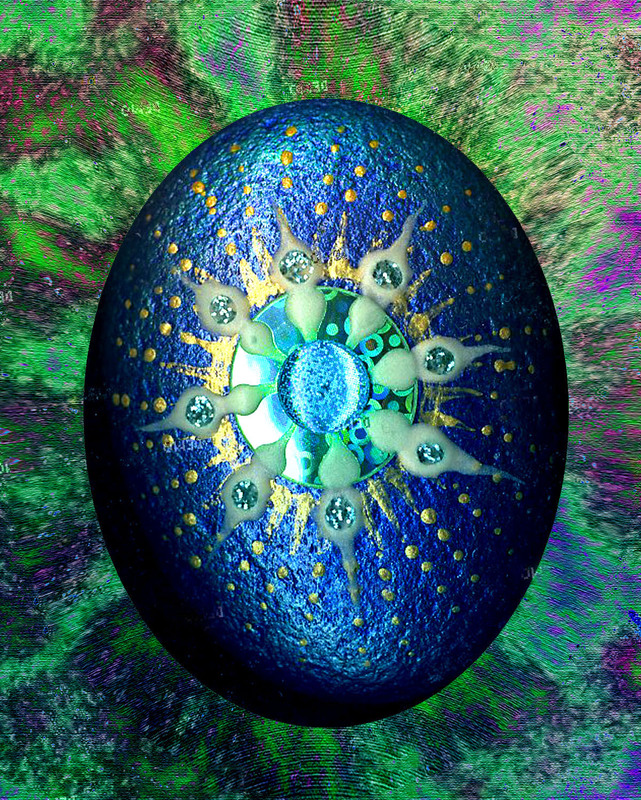 I wish you all an overflowing of loving kindness and a joyous summer of abundant fun. 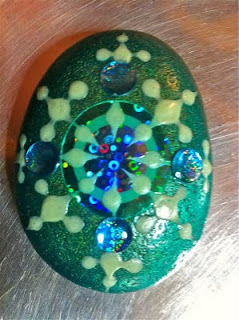 Now it seems like eons ago, but somehow I got the idea to drill holes in the Spirit Rocks to make pendants out of them. This proved to be a very labor intensive, time consuming proposition. Each hole took me about a half-hour to drill with a hand drill. Then two out of five of these rocks would crack and break. Great. Well, after visiting a craft shop in Guerneville, I discovered a handy little mount that adheres to the back of the rock with a loop, so that they can be hung from a lanyard or necklace. These are nice little show pieces that are eye-catchers for sure. I like wearing one, just to hear the nice compliments I get from people. Q. What do I do with my Spirit Rock? A. Use it as a placeholder in a book or as a paperweight on your desktop or nightstand. Have it be a reminder tool by putting it by the front door when you want to remember something. Q.Will it make me a more spiritual person? A.There is no guarantee here. 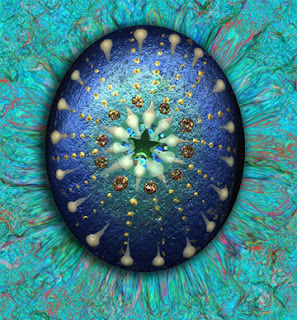 In the past, Shamans and priests have used rocks a way of connecting with their ancestors in tribal rituals.Today, people use these rocks as meditation devices for centering and focusing. Some say that it helps them quiet their mind and free their spirit. Q.Can I use it as a night light? A. The luminescent glow is activated by regular light, and only lasts a short time.Therefore it cannot be used as a night light. Q. Is it safe to put in water? A. No. Although the paints used are non-toxic, the surface can soften very easily and dissolve in water. Therefore it is wise to keep it in a soft cloth or bag. If you have your own Spirit Rock, or have given one to a friend, Welcome ! The Spirit Rock is not a pet rock, it has it's own unique quality. Some use these as a meditation device to center oneself. They are low-maintenance, enjoyable items to give and receive. It has been painted and decorated to encourage you to seek beauty in your own life. The Spirit Rock is a testimony to your good fortune and your future. 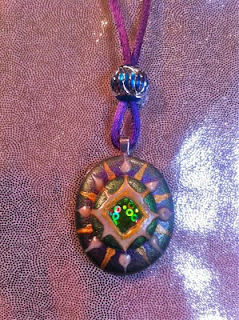 Carry one in your pocket, meditate with it and make it your own. It will help focus your attention and foster inner peace. If the rock isn't for you... then Pass it on ! These rocks have only as much power as you give them. Rocks, like good friends are kept around, and intended to be long-lasting. Be gentle with the rock.Don't throw or mishandle it. These are painted with water soluble acrylic paint. 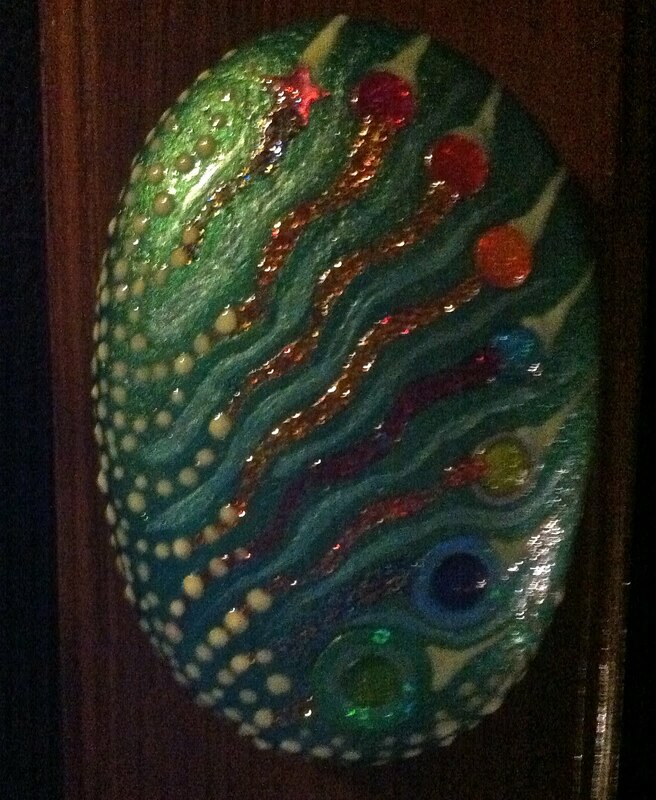 They are then decorated with glitter and glow in the dark paint, and finally coated with a varnish. The surface is NOT indestructible, so keep it protected! * Check the blog archive section for earlier posts and more information. Behold the Spirit Rocks ! When these rocks are exposed to light, the surface spots become illuminated. When it is dark, a glow is emitted that can capture your attention from across the room. But take note, the glow will fade almost as quickly as it absorbs the light and will eventually disappear. 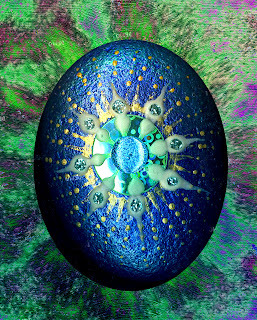 That is... until a blast of light reactivates the surface and the the design on the rocks begin to glow once more.